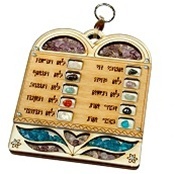 Made of wood, with lucite cover this wall hanging contains ten stones with 10 commandments in Hebrew. This is a colorful and ideal hospitality gift. 6.5" x 5.5"